Tehri Dam is the highest dam in India. This dam is an earth-filled embankment dam. Tehri Dam is built on River Bhagirathi. This dam is situated near Tehri in Uttarakhand, India. Tehri Dam is one of the highest dam in the world. This is a multi-purpose rock dam. The height of the dam is about 855 ft and length is about 575 m.
The construction of this dam begun in the year 1978 and opened in the year 2006. 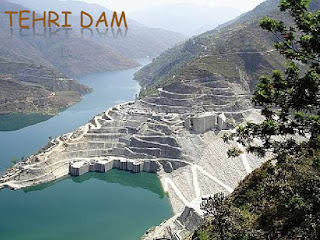 The primary dam of Tehri Hydro Development Corporation Limited is the Tehri Dam. The owner of Owner of Tehri Dam is the THDC India Limited.